Welcome to Welch Dental Center! Welcome to Welch Dental Center Cosmetic and Family Dentistry. 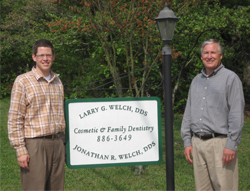 We are Larry G. Welch, DDS and Jonathan R. Welch, DDS . We offer dental services to the entire family. Our goal is to provide the best dental care available and to educate our patients on the procedures they need for a lifetime of oral health. We provide services to Signal Mountain, Walden, Chattanooga and the Sequatchie Valley. We also have patients who continue to receive their dental care with us from as far away as Chicago, Atlanta and Massachusetts.